On Tuesday 23rd April 2019 the sun will rise at 05:54 and will set at 20:40. It will be a mild day, with temperatures reaching around 19.9°C. Today is expected to be a dry day, with a very low chance of rain. It will be quite a breezy day, with a maximum expected wind speed of 17mph. On Wednesday 24th April 2019 the sun will rise at 05:51 and will set at 20:42. It will be a mild day, with temperatures reaching around 13.9°C. A light shower is possible, 2mm of rainfall is possible today. It will be quite a breezy day, with a maximum expected wind speed of 19mph. On Thursday 25th April 2019 the sun will rise at 05:49 and will set at 20:44. It will be a mild day, with temperatures reaching around 13.4°C. Some moderate to heavy rain is expected, 5mm of rainfall is possible today. It will be quite a breezy day, with a maximum expected wind speed of 13mph. On Friday 26th April 2019 the sun will rise at 05:46 and will set at 20:46. It will be a mild day, with temperatures reaching around 11.8°C. Some moderate to heavy rain is expected, 7mm of rainfall is possible today. It will be quite a breezy day, with a maximum expected wind speed of 19mph. On Saturday 27th April 2019 the sun will rise at 05:44 and will set at 20:48. It will be a mild day, with temperatures reaching around 13.5°C. Today is expected to be a dry day, with a very low chance of rain. It will be quite a breezy day, with a maximum expected wind speed of 13mph. On Sunday 28th April 2019 the sun will rise at 05:42 and will set at 20:50. It will be a mild day, with temperatures reaching around 12.3°C. Today is expected to be a dry day, with a very low chance of rain. It will be quite a breezy day, with a maximum expected wind speed of 17mph. On Monday 29th April 2019 the sun will rise at 05:39 and will set at 20:52. It will be a mild day, with temperatures reaching around 9.2°C. Today is expected to be a dry day, with a very low chance of rain. There will be a gentle breeze in the air today, with a maximum expected wind speed of 12mph. Our five star luxury cottage, with its own cinema room, sauna room and rainfall shower, multi room music system, wood burning stove and stunning cast iron roll top bath, is perfect for a relaxing and romantic break for couples, in the quiet village of Bunavoneader, on the Isle of harris, in the Outer Hebrides. 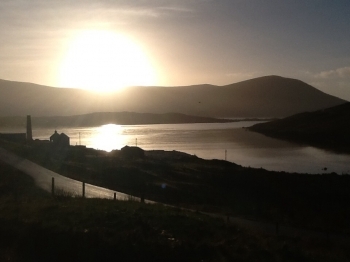 The cottage overlooks a sea loch and is centrally located on the landmass that is Lewis & Harris. The backdrop to the cottage is the tallest hill on the Island, the Clisham, part of the North Harris hill range.